Investing in an expensive pair of jeans can be worthwhile, since you can pair it with almost anything or any occasion. With prices over $200, taking care of your jeans is important to ensure they stay in good condition. Some people say washing your jeans by hand is best, others say use the machine, while some others don’t wash their jeans at all and only opt for dry cleaning them. 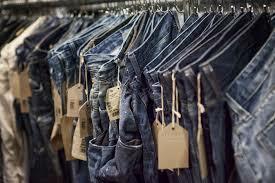 Here are some tips to prolong the life of your jeans. Raw denim needs at least 6 months to to contour to the shape of your body. Therefore to maintain the best shape, avoid washing them for a few months. If you have a pre washed pair (these are jeans that look faded), you can wash them when they start to sag or get stained. To get rid of the smell between washes, hang your jeans near the shower. The steam will help to freshen them up. If that’s not possible, you can freeze your jeans for 2 days in a ziplock bag. If you have a dark pair of jeans, include a half cup of distilled white vinegar, at the final rise stage of your wash.
Lay/hang your jeans flat or upside down to dry. Always air dry your jeans or turn the heat at the lowest setting on your dryer. Try to remove your jeans before they are completely dry.